Reasons For Upgrading: During the battle Madness Vs. Supreme power, Eric managed to unlock the final level of the madness transformation but due to his injuries. The mad demon could fully control the power until ater healing himself and escaping the demon queen's wrath. Throughtout battling and controlling his DE energy the mad demon was able to create and ultimate form from his anger power. » Ultimate State Benefits: Immortalized Demonic Knight Strength: The strength of a Fallen Demon Knight; this also the unknown level of the mad demon. Eric's physical strength is really shocking and superiorly fierce of such an unbelievable level that even his actions cause great destruction and deadlier damage. Very stronger/powerful attacks might hurt him but they wouldn't have power of defeating him, Eric can actually block attacks depending on their strength. He's able to overpower an person's bankai and othee powerful & stronger attacks with his one punch/hand slap yet it hurts when does but thanks to his ultimate strength. With mad brute force behind it, he's able to break or destroy through the walls to destroy buildings and structures with his true demonic rage. Perfected Demonic Speed/Reflexes: Unlike his other forms, Eric's speed and reflexes have been greatly augmented to the point where the demon knight can move faster. Yet his agility and reflexes to dodge oncoming attacks that have do him harm. Eric is shown to used his quick speeds along with his reflexes to gain the upper hand on a enemy or find ways to outsmart their combat strategy. Eric has become fast enough to outrun his own energy attacks, allowing him to strike and enhance them or launch simultaneous attacks. Eric can keep up with a shinigami's shunpo speed, iramasha's spped or arrancar's sonido speed yet the guy can appear to be 250% more faster in this demon knight state. He can actually match a captain's shunpo or espada's soindo speed, vizard's speed or ziamichi's speed depending on the enemy's speed. Intensified Striking Power: Because of the demonic gauntlets of the demonic knight armor, Eric's striking power is increased by 150% percent. Because metal rings & demonic claws kinda lock the demon fingers which improve his fists allowing his enemies to feel his punches effectively. Also each punch is imbued with the flame magic which increase the power with some deadly pain. Warrior Demon-Knight's Durability: Due to many enhancements & demon knight armor fused within the demon knight body. Eric has a unstoppably strong resistant to damage all due from the body which happen when the mad demon unleashed against the demon queen. Most of the defensive powers of the knight demons combined within the ultimate demon form. It would take a whole lot of attacks well stronger & powerful ones which may hurt the mad one perhaps worse. The demon knight armor can be destroyed leaving the demon open for damage for attack. Higher Demon Ability Knowledge: Eric Zarathos was trained constantly to use his demon abilities when he was a child he started fully understanding a demon's natural abilities. Throughtout this knowledge was helpful throught his battles yet he started studying the many other benefits of different demon abilities. He constantly uses the Affinity Of Hell with his normal form and demon states for stronger and new powers. The demon uses Curse Effect to implant curses when he has a good chance of winning a battle or wants to make his enemy's life a living hell. The Sacrifice Incantation is used whenever he wants to upgrade and enhancing his body with deadly and destructive powers. The best demon ability that he likes using is the Black Inferno Blast which is one powerdul blast of destructive energy the best thing he's ever seen. Yet the demon is good learner and powerful warlock in the use of the Art of Demon Magic when it using it powers to heal himself or using different magical demonic powers and effects in battle. Hellborn Telepathy Powers: Because of his demon knight power, Eric has very strong telekinetic powers to moving objects from one place to another without using physical contact. Which means he could stop an Kidō attack and send it off to another direction or back to the enemy. Also having the ability to talk in people's minds when important information or tricking a person comes to pass. Eric is able to stop an stronger shikai attack but stronger bankai takes a lot of mind control to stop it can blow up in his face if not careful. Eric can only his telekinetic powers only about eight times because to large drain of powers it does to his demonic spiritual power and his demonic mind. 1. )Immense Wild Senses: An greater augmentation of the wild senses at a immense level. Unlike the warlord bloodeyes, Eric has learned many new tricks of sensory skills of the six deadliest animals of the known world with the final berserker's eyes. This immense power focused of sense of the animals allowing to sense & point an enemy's movements at a very high and great augmented speed. With the wild senses, Eric can quickly detect any of speed the enemy is using examples like flash step, sonido, chaos warp, quincy's hirenkyaku or powerful high speed of the enemy. A dark combination of shadow movement & greater energy manipulation of zoa koa in an new devil hunter sort of way. 2.) True Exodus Fist: The ultimate power of the Exodus Fist. The original power has seven elemental magic powers this mega version give the two elements the force of 400 small ones, they will infuse themselves in the demon's right hand making it stronger almost into an augmented burning metal fist. Eric rushes at the enemy attacking when the punch is deliver the impact actually the elemental magic themselves attack the enemy's pressure points in the arms and chest. At first nothing happens. Then a large nuke explosion erupts inside the enemy's body destroying vital organs and some bones in the arms and legs. This can be blocked if it is the enemy will feel 95% of the attack and something inside the enemy will be burning. If it dodge the enemy will feel 45% of the attack almost like a shockwave hitting him. 3.) Ultimate Destroya: This is an Demon-exclusive technique that hardens the user's zoa koa and releases it in a swift yet potent giant flame blast within the fist. While similar in function to an arrancar's Gran Rey Cero, the technique is not nearly as powerful, though thanks to its composition its speed is 50 times faster and allows for it to be fired in quick succession. In addition, it possesses more concussive force than a typical Gran Rey Cero does. 4.) True Demi Archangel of the Justice: The true ultimate ability. Eric splits himself in half as unknown kage dimensional gateway forms inside unlocking to an hidden dimension. Eric opens up his body and a fallen archangel with appear as the demon archangel starts to awaken. Eric will dissapear and the demon archangel with emerge from the remains of the mad demon's flesh. The Demi Archangel will have all of Eric's powers and abilities. Yet Eric's skill set will be boosted by one but it can't exceed master. The Demon Archangel's name is Joshua Iramasha. 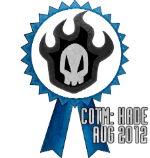 Once Kade Hiroshima's original first and true name. The final attack of the Fallen ArchAngel is Last Rites the ultimate megadeath attack. With one finger, the fallen one summons both angelic and demonic energy as massive spiritual energy spear imbued with arrancar's spiritual power, iramasha's chaos power and finally demon zoa koa power. The demon archangel grabs the spear and then starts crying a tear of a human and of a demon enhances the power of the spear even more. Which turns the spear both white and black. Once thrown and if it hits the target the blast radius is shocking nothing human would survive it. The enemy would need a barrier or strong defense to block the massive blast. Actually the blast radius is 25 miles long. This can be blocked by a stronger attack but the enemy will feel 95% of the attack. Demi-Flame Powers: From accepting his new powers, Eric has been given unique ability from his madness powers which he can enhance even augment attacks with dark red flame energy giving much more powerful & deadly effect. Initially this was uncontrollable, but after enhancement by some training. Eric can mostly control this bone power creating attacks and defenses from his powers, creating weapons, attack and defenses with his dark red flame powers. When using dark red fire power, Eric's arms can transform taking on a different attacks when using flame weapons or lightning attacks. Also Eric's dark flame attacks can be defeated or counter by a stronger defense or strong energy barrier depending on the strength and defensive power of that enemy. However, Eric's defensive powers can be weaken if his dark flame weapons are damaged by other stronger elemental attacks by his opponents depending on their attack strength. True Summoning Power: From Engra's training, Eric the demon of madness was trained into an advanced form of necromancy how to summon things with his necro summoning power. The mad demon lost control of the power and his summon creations. At the time. Eric couldn't control the power of summoning all by himself but through hours of training the mad demon finally gain complete control of his summon creation. Over the years, Eric has defeated a number of stronger opponents now with his summoning power the mad demon has harness the power of five warriors. Each warrior if of an unique race and unique ability which they can use in battle. But their is one rule that they must be follow and this is the important rule that the mad demon brought them back into this world and they must serve him period. The demon of madness call each summoned member of his new team called "The Fallen". Any Extra Notes: My ultimate goal is to get Grandmaster in Strength, Magic & Breakdown. But I'm not ready for this priviledge or the right yet. If I have to fight and continuing training so be it....I will get this soon enough it just a damn matter of time. Being that Kade did not post any status update on this power upgrade thread, and myself falling under the assumptions that these powers were approved somewhere else based on seeing Zorin Blitz in another thread, I'm moving this into archives to clear up space in power upgrades.